Carlo Vallati visited the lab in Aug/Sept 2015 – here is a short note he wrote on his time here. I had the pleasure of visiting ICCLab during Aug/Sept 2015 to work on a research proposal. By way of background, I am a postdoctoral researcher with Computer Networking Group (CNG) at the University of Pisa. My research interest focuses on the Internet of Things and Machine-to-Machine applications. I visited the ICCLab for a month to write a proposal for the prestigious EU Horizon 2020 Marie Skłodowska-Curie Individual Fellowship scheme. The proposal focuses on providing cloud support for the execution of Machine-to-Machine applications – applications that rely on direct interactions with objects such as sensors and actuators – with low latency interaction requirements. In particular, the project will work on extending the current cloud computing architecture through the integration of cloud nodes close to physical devices, e.g. Fog nodes or Local Data Centers. Should the proposal be successful, it will provide funding to enable me to work on this topic with ICCLab and an industry partner (the proposal includes a secondment to a specific industry partner). During the visit, I also took the opportunity to explore possible future collaborations and joint research activities between ICClab and CNG and we had initial discussions regarding joint work in other contexts, but these will take some time to come to fruition. Apart from the good work that was done, I really enjoyed my visit to ICClab! Its international composition was the perfect environment to ensure fast integration during my short visit. Tight interaction with lab members (big thanks to Sean in particular!) helped me write a strong project proposal. 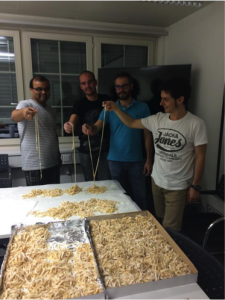 The lab’s friendly environment is great; Vincenzo and I organized an Italian dinner in which we cooked homemade pasta using my grandmother’s secret recipe (see pic above) and everyone was so nice to pretend that pasta was actually good! This entry was posted in Articles, Visits and tagged collaborators, h2020, marie curie actions, marie Skłodowska-Curie actions, visitors by Sean Murphy. Bookmark the permalink.